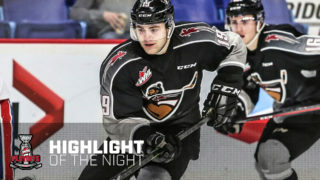 Defenceman Alex Kannok Leipert (Regina, SK) joined the Vancouver Giants full time for the 2017-18 season and made an immediate impact both on the ice and in the classroom. Kannok Leipert captured the team’s High School Scholastic Player of the Year Award and chipped in with a solid five goals and 16 assists for 21 points through 60 games. Defensively the Giants are loaded with depth and Kannok Leipert hopes to play a prominent role with the Giants in the seasons to come. Earlier this week he spoke with Giants broadcaster Dan O’Connor from his home in Regina, SK. As you can imagine, the past few months have been a whirlwind for Kannok Leipert who has been training hard, coaching a bantam hockey team, preparing to graduate high school all while helping raise an impressive amount of money to create a scholarship for the late Adam Herold – A former Midget AAA teammate of his who lost his life in the Humboldt bus accident on April 6. 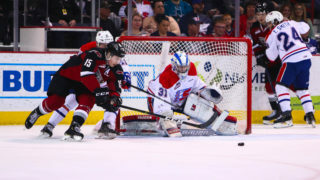 Here’s an in-depth Q & A with Giants defenceman Alex Kannok Leipert. DO: I’ve asked a few guys this question and I’ll ask you to: Game 7. Victoria Royals. Are you over it? Or do you still think about that game and that series? AKL: I think I’ve come to pretty good terms with it. The biggest thing for me is that I’ll always think back to that. Going back-and-forth between the two places and and the highs and lows that come with it. The biggest thing is that a loss like that builds character. That’s just the way it goes. DO: But how much fun was it? 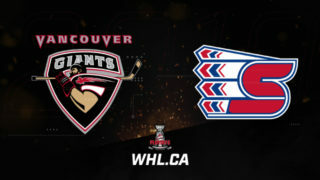 For a lot of you guys it was your first taste of WHL playoff hockey. 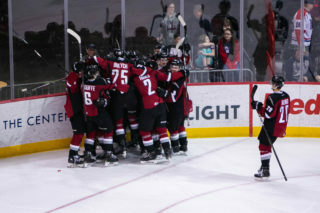 You’ve played in big games and competed for championships at other levels, but would you say that the WHL playoffs were a ‘game changer’ in that regard? AKL: Definitely. It’s a whole different feeling. I want that feeling back. You get so attached to the whole experience. DO: Despite losing that series, did you feel like the group became even more cohesive? AKL: I think that series showed all of us what we are truly capable of when it comes to the next few seasons. We’ve had a small taste and now we have a better understanding of what it takes. DO: Last season had to be a pretty cool one though for you both on and off the ice. I’m sure you came to Training Camp expecting to make the team and expecting to be a big contributor, but it’s one thing to expect it and it’s another thing to live it. Can you take me back to the start of the season and tell me a little bit about your approach and mindset knowing that the expectations were going to be bigger? AKL: Everything became REAL this year. For so long you’re thinking about the future and talking about the future, but then it was time to actually live that future. I was so lucky to have great coaches, good teammates and it was unreal to have played in Vancouver and to have those fans behind us, especially during the playoffs. The whole experience of last season was something that I’ll really cherish. DO: The word ‘development’ is thrown around so much, but when you look at yourself can you talk about the changes you noticed in yourself even from the first game in September compared to the final game in early April? AKL: Heading into the season I knew that there would be some open roster spots and there were a lot of younger guys who’d all be competing for spots. Coming in with guys like Bulych, Byram we all worked very hard. We spent so much time working on everything. From beginning to end our maturity level went up so much. We pushed each other to be better. The coaches pushed us to be better. It was really good for me personally and I think I developed a lot and learned how to handle myself in a lot of different situations both on and off the ice. DO: You, Kaleb and Bowen in particular spent a TON of time with Dean Chynoweth going over video. Has that always been a big thing for you? Have you always spent a lot of time in the video room with coaches previously? AKL: For sure. I’ve always tried to approach the game with an open mind. I’ve never been shy to ask a lot of questions and to even ask for help if I think I need it. I think it’s valuable to see the game from a different point-of-view and to go through it all with somebody who’s got a different set of eyes watching the same thing is big for me. Dean was awesome for us. He always had clips ready and we saw that he wanted to work with us, so that made it easy for us to seek him out and to spend the time working with him and getting better. DO: Was there an older teammate that you can credit for really helping you along? Be it on the ice or off of it? AKL: I loved playing with Matt Barberis. He was always talking to me on the bench and it was great because he’s been in the league for a long time and he took great care of me in that regard. Also, our 20-year-olds were huge. Darian, Ty and Brennan were all awesome and had great insight into how to practice, how to prepare, and how to treat other people and teammates and how to react to certain situations. They’ve been around and seen a lot over the course of their time in the league and as the season wore on they kept everything positive. For me it was great to take some of those lessons from them because I think it I can a lot of those things and use them for myself as I get older and more established in the league. DO: Do you want to be a future leader on this team? Do you want to be counted on more as you get older? AKL: For sure. Whether it means wearing a letter or not I want to be leaned on. I want to be there for guys. I want to continue to build myself as a reliable leader and somebody that the coaches and teammates can trust. DO: Is there a specific area of training that you’re really trying to hone in when it comes to next season? AKL: The two biggest things for me are going to be: Footwork and in tight, corner situations. That’s where games are won and that’s the focus of my improvement this summer. DO: The NHL draft is coming up in a few weeks. Have you been talking to teams? How much attention and emphasis are you placing on the draft? AKL: I’ve talked to a few teams, but honestly I’m at peace with whatever happens. It’s not the be-all, end-all. If it happens great, if it doesn’t that’s okay too. I’m just going to keep doing my thing and we’ll see what happens. DO: The Memorial Cup was in Regina. Did you follow it closely? AKL: I still had friends playing (for both Swift Current and Regina), so I really enjoyed watching. I was able to support them which was nice. It was great coming to watch the Swift Current Broncos because it felt like half the stadium was full of fans who came to watch from Swift Current. It was great for the whole province. DO: How important is it for you to take some time to ‘unplug’ from the game? AKL: I think it’s good to take a step back from the game sometimes but I’m still very involved in the game with training, plus I’m helping coach my younger brother Hunter’s (bantam) spring hockey team. I play roller hockey too with some buddies, so I’m still involved in the game but I’m having lots of fun doing it. It reminds me of what it was like when I was a kid and not having to stress or worry about what might happen. DO: Really? You’re coaching? That’s great! Tell me more about that. AKL: Yeah my little brother is 14 and I’m helping coach the defense on his spring team. Coaching provides a whole different view of things. It’s been very eye opening for me. Coaching is a lot harder than you think. DO: Do you think that standing behind the bench as a coach could maybe help you more as a player? AKL: Maybe from the aspect of thinking about the game less as an individual and more from a complete team perspective. I think it’s a good experience to have in my back pocket. DO: You’re two weeks away from graduating high school. Are you excited to graduate? Do you think it will be easier to focus on hockey next year now that high school is done? AKL: Honestly I’m going to miss it. School’s been great because it’s really helped balance me out. I’ve really liked being in a classroom and using my mind to focus on things other than hockey sometimes. I mean definitely it will be great to graduate and get that off my plate, but then it’ll be important for me to find something else that help me escape. School’s always been a big deal in my family and has definitely helped provide me with a great escape. DO: I’m sure Mom and Dad were happy when you were named High School Scholastic Player of the Year for the Giants? AKL: Definitely. My parents were always quite strict with me when it came to school and always really pushed me positively to do my best and to get the best grades possible. I’ll always remember winning that team award because nobody can ever take that away from me. 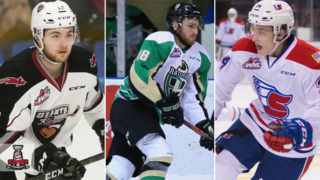 DO: Being from Saskatchewan and knowing that you’ve had friends and former teammates affected by the tragedy in Humboldt can you tell me about the feeling right now in the Province? I’m sure this will always be on people’s minds to varying degrees but are things starting to improve and feel more normal than they were a month or so ago? AKL: I was just down at the Herold’s farm a few days ago. It was great to spend some time with Adam’s family just hanging out and talking. Everybody’s still trying to find their own way to distract themselves and to to find their best way possible to heal. It’s been tough but it’s also been great to see the outpouring of support and how the province and the hockey community has been able to rally together. We had a fundraiser recently for Adam and we were able to raise over $80,000 towards the Adam Herold Legacy Memorial Fund. We don’t want him remembered just for being a hockey player. We want to remember Adam for the type of person he was. It will continue to take time but as a province we will continue to heal. Just look at all of the stickers and the ribbons that you see. Every time I drive I probably see 15-20 of them. It’s very special to see. AKL: It’s so exciting to think about. I don’t want to waste a single second of it. I think collectively we know we’re building something special and it will be important for us to continue to improve and develop and enjoy the experience as we’re living it. We want to bring a championship to Langley and build something special for ourselves as a team. Heading into the season I knew that there would be some open roster spots and there were a lot of younger guys who’d all be competing for spots. Coming in with guys like Bulych, Byram we all worked very hard. We spent so much time working on everything. From beginning to end our maturity level went up so much. We pushed each other to be better. The coaches pushed us to be better. It was really good for me personally and I think I developed a lot and learned how to handle myself in a lot of different situations both on and off the ice. – Alex Kannok Leipert reflects on last season.